Jack Soll and I recently looked at people’s intuitions about car fuel efficiency when expressed as miles per gallon (mpg), which is the common measure used in the United States. We realized that the mpg scale was not intuitive. If you are buying or trading in a car, what mpg increases are worthwhile in terms of reduced gas consumption and carbon emissions? Certainly a car that gets 50 mpg looks great compared to one that gets 33 mpg. But many other trade-ins for small improvements didn’t seem worthwhile. Why bother trading in a 16 mpg car for a 20 mpg one? Why bother putting hybrids on huge SUVs (like the Chevy Tahoe or the Cadillac Escalade), increasing their mpg from 12 to 14? What’s the environmental payoff? Surprisingly, however, for the same distance driven, each of the improvements listed above is equally beneficial in reducing gas use. They all save about 1 gallon over 100 miles and 100 gallons over 10,000 miles (with a little rounding). Without question, 50 mpg is the most efficient level and ideally everyone would strive for it. But, if we are simply considering changes to existing vehicles, 16 to 20 mpg can help save as much gas as 33 to 50 mpg. In short, although mpg always tells you which car is most efficient it obscures the value of improvements as fuel efficiency improves, leading people to undervalue small mpg improvements on inefficient cars, and overvalue large jumps between efficient cars. We call this effect the “MPG Illusion,” and published a paper about it in the journal Science last week. So don’t dismiss that hulking Escalade. Gallon-per-gallon, it’s a big improvement. Of course, none of our conclusions are too surprising once you apply a little math. Miles per gallon is a ratio. Gas consumed is an inverse of that ratio. A ratio and its inverse do not have a linear relationship. 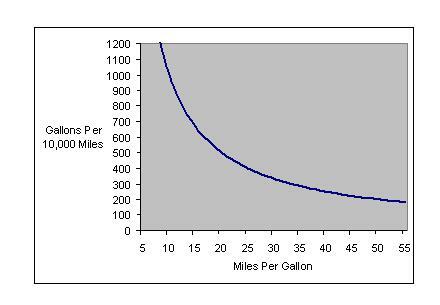 They have a curvilinear one, as shown in the graph below, plotting gallons used per 10,000 miles driven (10,000 divided by mpg) by mpg. Gallons per mile should help consumers recognize the value of replacing inefficient cars in the 10 to 20 mpg range. Ten thousand miles not only makes the difference look large, it is close to the national average for yearly driving. It’s a realistic estimate of fuel consumption for many drivers. And, because the number is round, it is pretty easy to adjust up or down for actual driving. The perfect gpm expression, however, would be to a personal distance. We’ve created an excel worksheet like this that is available on the MPG Illusion web site. We prefer putting gas consumed in the numerator, rather than cost, because gas prices can change substantially in a short period of time. Also, a direct measure of gas consumption is just one step away from calculating greenhouse gas emissions from burning gas (one gallon equal a little over 20 pounds of carbon dioxide). The gpm measures listed above also point to a clear policy implication: Replacing the most inefficient vehicles, and improving their mpg by a seemingly small amount, can make a big difference in total gas consumption. In fact, it can make a larger difference than replacing a Honda Civic with a Toyota Prius. 1) We are not proposing to replace mpg, just to supplement it. Miles per gallon is very useful once you own a car and need to know the range of the gas tank. However, gpm is more useful when deciding about replacing a car or choosing between two cars. Both measures are useful at different times. 2) The metric system does not solve the mpg illusion. India uses kilometer and liters but expresses efficiency as kilometers per liter. Because the ratio is distance over volume, it creates a parallel illusion to mpg. See this blog for a nice translation to the Indian context. Many countries currently use liters per 100 kilometers, which has the right numerator and denominator. However, some people living in those countries have questioned how helpful it has been. We think that the base distance should be larger so that differences between efficiency levels are clearer and involve fewer decimals. 3) Displaying the percentage increase in mpg does not solve the MPG Illusion either. Many people look at a 50 percent mpg improvement, such as 33 to 50 mpg, and assume that it will save more gas than a 30 percent mpg improvement from 10 to 13 mpg over the same distance. A quick check of the math will show that 10 to 13 saves 230 gallons over 10,000 miles; 33 to 50 mpg saves only 100 gallons over the same distance. Percentage increase in mpg, like linear increases, is a fallible indicator of improvements in efficiency. The problem with percentage reasoning is that the percentage change has to be applied to an initial level of gas that is being consumed. One of the beauties of gpm is that private organizations can take the lead in promoting awareness about the mpg illusion. If Consumer Reports, Edmunds, and car manufacturers started using gpm to express fuel efficiency, the actual value of replacing inefficient cars with more efficient cars would be clear. Car buyers could make better decisions to their own benefit, as well as ours. Addendum by Richard Larrick: I will add that the Cadillac Escalade is acceptable only if it is replacing identical miles from a worst car! Otherwise, forget it. Addendum by Nudge blog: Mahesh Sethuraman thinks cars should come with a cost meter that calculates the cost of each mile travelled based on the cost of gas and the vehicle’s current mileage. Imagine a “cost meter” (which takes the cost of petrol/diesel and the mileage of the vehicle as inputs) connected to all the motor vehicles which displays the cost of every meter of travel just like a “speedometer” and as an add on it could have a sensitivity meter which shows what would be the cost of every meter of travel if the petrol/diesel price rises by another 10%.A similar device for cooking gas and for that matter for usage of any non-renewals sources of energy. Maybe just maybe this might instill a greater discipline and judiciousness in consumption of scarce, non-renewable sources of energy. If it does, then this would be a very effective way for disciplining consumption to a level which would have otherwise taken another 5rs hike in prices. And even if it doesn’t, this experiment isn’t very expensive! How is buying an Escalade still acceptable? Consider this, I am paying the price for someone either continuing to run an extremely inefficient car (say mpg) or an escalade that run 30% more efficiently (just for argument sake 13 mpg). When I am running a car that 500% (five hundred percent or 5 times) more efficient than this person’s I cannot accept your argument. Why should I accept the social burden that this person is putting on me with his glorious ignorance and illusions of efficiency. Guess what my 50 mpg car still runs almost 4 times (400 %) more efficiently than the spanking new “efficient” (Ha!) escalade. I like the rule of thumb that any metric that you want masses of people to understand should be as close to one as possible. People understand one, and ten, and a tenth, but not much outside that. Maybe you want a metric more like gallons per 10 miles or per 100 miles. this gives a side to side view of cars MPG, along with C02 and other data. Im also trying to build a real world MPG database into it. (only 10 entries so far) but anyone please visit and yours..
gallons/mile is just as useless of a metric as miles/gallon. The number that should be plastered on the side of the car is dollars/mile. “Driving this will cost you this much this year at an average fuel cost of $x/gal and an average yearly distance of 12,000 miles”. Just like they do on the yellow tags they’ve been sticking on refrigerators and other home appliances since the 1970s. Um…we’re still talking about the difference of using 2 gallons/ 100 miles in a 50mpg vehicle, versus using 5 gallons in a 20mpg vehicle, about 6 or 7 gallons/100 miles in a 14mpg or 16mpg vehicle. In both the cost to the household, and damage to our planet, those are big differences. Saying that the change is the same is just justifying a terrible choice to start with. And in North America, it often isn’t even a choice – car manufacturers do not offer the same efficiency in their cars as they do in other countries, but instead charge a premium if you want high efficiency. They probably would say that is because that is what customers want, but that is also because of how they advertise their cars (for power, not efficiency). They have contributed to creating this sick car culture. In Sweden, where I used to live, fuel efficiency is expressed as liters per Swedish mile (a Swedish mile is 10 km). This comes pretty close to fulfilling Amy’s criterion, since cars then tend to hover somewhere around 1 or so. It has the disadvantage of making significant differences look small. An American can roughly convert MPG to this measure by dividing 26 by the MPG measure. My 30 MPG car comes out to 0.87 liters per Swedish mile this way. As you can see, a 40 MPG car comes out to 0.65 liters per Swedish mile. The difference between 0.87 and 0.65 doesn’t seem very significant just because the quantities are so small, even though it is fairly significant. Of course, if you’re used to thinking of fuel efficiency in terms of this scale, you probably know what’s significant. It may save more, but who cares? We are trying to use less, on an absolute basis. Save money, don’t warm the planet. And, buying a 50 MPG car frees up a used 30 MPG car for the people trying to ditch their stupid SUVs. Just found your site. AWESOME ideas. I’m always looking for things like this. Have you ever done any reseach about converting a car to full electric? I heard that it’s not only possible, but that it can be done pretty cheap, if you know where to look. In the past, when drivers traded up for better fuel economy they offset the fuel savings with more driving…and bigger cars (along the same lines as what you’re saying). What we really need is for people to face the fact that they should drive a lot less. Even driving full electric poses problems – it simply converts the oil depletion and tailpipe pollution issues into electricity generation and powerplant pollution issues. with every car I have owned, I have keep a spreadsheet that track gallons per mile, different octanes, times of year, and gas stations. it helps b/c i know exactly how much each trip costs and i use the info to compare to train prices. I actually used the info at a public forum to convince the local transit board not to close down a train station. As it turns out, they thought they could close down a station with free parking, and force ppl to the next station with a paid garage. what they didn’t factor in that for most cars, the dollars per mile to the next free station further away was still less than the shorter drive plus parking. This is a great discussion, and I agree with the mpg vs gpm comparison. But that’s really just half the story. Large vehicles (like the Escalade and many pickups) weigh in at a minimum of 5,415 to 5,708 lbs, while a smaller car (Prius or even a Chevy Cobalt) weigh in between 2,681 and 2,921 lbs, about half the Escalade. Therefore, a key point in resource conservation is not just gas savings but natural resources consumed in the production of the vehicle. Smaller vehicles use about half the resources as larger one. That is critical, since the metals there in are on an increasing limited supply. A Ratio is a Ratio , if its inverted or not. I had a Saturn SL2 that got 30 mpg in the summer in suburban commuting. The Prius that replaced it got 65 mpg in the summer in suburban communting, That is a ratio of improvement of 65/30, which is the same as a a Ratio of (1/30) / ( 1/65) . Again, the improvement ratio in MPGs or GPM s is exactly the same. The problem with a the 12 MPG SUV to the improved 14 MPG SUV is the ratio of improvement is misrable. They never really hybridised the Tahoe and Escalade – which is to reduce engine power to over come the partial power problem of engines. Reducing the engine power requires the engine to run closer to its efficient power level more often. Putting a BIGGER engine into the hybrid version of these SUVs is the real problem. Dr Frank used a the same engine as was in my Saturn SL2 in his hybrid Suburban. That is true series hybridization, not what GM is trying to foist on the the public…. I can see the maths behind this and everything, but I can’t see the point. If people tend to think that changing between a 45mpg to 50mpg car is as rewarding as changing between a 15mpg to 20mpg then why change that? Surely you want to encourage people to change their 15mpg gas-guzzler to a 50mpg green machine not just settle for a 20mpg gas-guzzler, and it seems to me that by showing that the difference between 30mpg to 45 is not as good as 15 to 30mpg, it gives people an excuse to only get a 30mpg car next time and takes away the incentive to be more green. I do believe that most people don’t like to pay taxes, in Europe taxes on gas for car are about 65-70% of the price. A cost-meter which indicates the payed taxes per hour on a big display would help, further taxing brake pads with > 10000% or adding an exhorbitant fixed-fee would also help. The most heavy cars will suffer most.